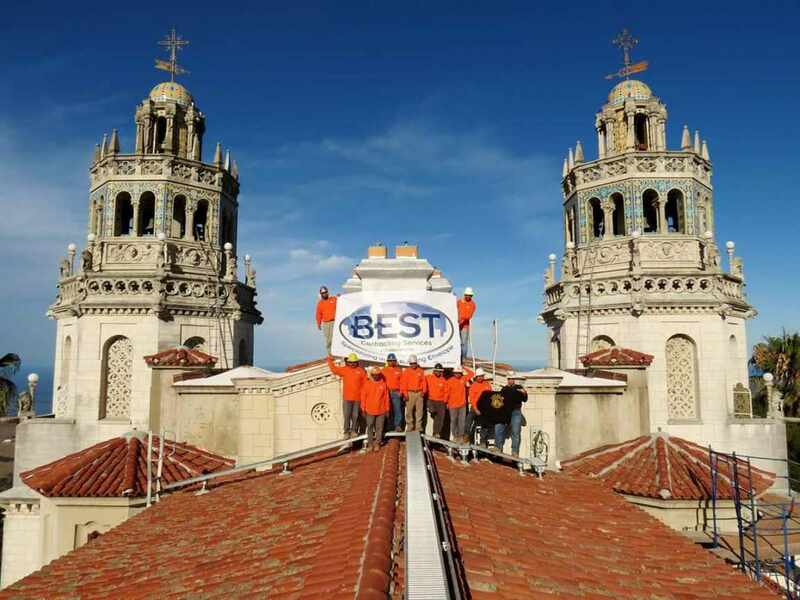 GARDENA, Calif. - Nov. 16, 2015 - PRLog -- The Hearst Castle Re-Roof Project seems fairly simple on paper with around 150 squares of tile and 25 squares of built up roofing, but as the project began there were a few interesting challenges that were overcome to prove BEST Contracting Service’s role as a leader in the roofing industry. One of the challenges was the fact that “La Casa Grande” or The Casa Grande at Hearst Castle is not only a State Historical Monument, but also a working state park that only shuts down for a few select holidays. With between 1500-6000 visitors a day this made the mobilization and setup a logistical challenge. Throughout the project, workers coordinated their timing with the tours to ensure the safety of the public while having minimal impact on public access. The discovery of the bat population that was living in the existing tiles also presented a challenge. Especially since this discovery occurred very close to Bat Maternity season. To help overcome this interesting challenge, BEST Contracting Services hired H.T. Harvey, a company that specializes in wildlife ecology. They setup ultra-sonic devices to deter the bats from returning to their roost so the tile could be removed. Once these tiles were removed there were some issues found with the underlayment and anchoring systems which caused some delays. However, BEST Contracting was able to work together with CA State Parks and Rec as well as California Access Scaffold to mobilize rapidly around the castle to get the re-roof project finished in August. Which was right before the Bat Maternity deadline that would have shut down the project until September. The Hearst Castle has nearly 14,500 square feet of ceramic tile on the roof, which helps to protect and preserve the extraordinary art collection as well as the architecture of the castle. As a designated historic building, it could only be repaired by salvaging as many of the original tiles as possible to maintain the historic fabric of the estate. “La Casa Grande” has hosted many influential guests such as Winston Churchill, Charlie Chaplin, and President Calvin Coolidge to name a few. BEST Contracting Services was happy to be able to be a part of restoring a California State Historical Monument. : BEST Contracting Services Inc.